A Goodbye Visit with my GrandmothersteemCreated with Sketch. I can't recall the first memory I have of my grandmother. She was always just there. Last week, for the first time in my life, she wasn't. She was well past 80 and in failing health. Her passing was neither unexpected or, with the exception of some family drama, particularly tragic. It was this predictability, in fact, that allowed me to travel to see her exactly two weeks before she passed away. My last visit with my grandmother is a memory I will cherish for the rest of my life. The events leading up to that visit and the time spent with her taught me several lessons. This post is my attempt to share that wisdom along with the story of my last day with her. I have always felt that I had a special relationship with my grandmother. 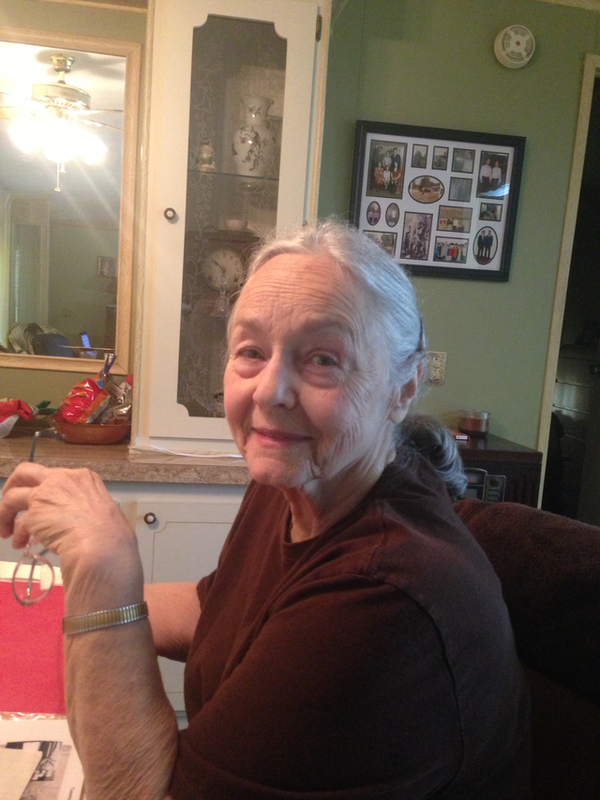 She had five grandchildren – I was the oldest. I know her relationship with my cousin was closer than the one she had with me. This was for a variety of reasons – personality, matching gender, proximity. In spite of all that, my grandmother made me feel like I was her favorite. I hope she made the other four grandkids feel the same way. But I felt like I was her favorite nonetheless, and in return, she was one of my most favorite people too. Visits to my grandparent’s house were always one of my favorite parts of the year growing up. We got to see them once every few months or so. When I was around 8, my grandparents moved to Florida part time, coming back to the mid-Atlantic each year to summer at my Aunt’s house in their RV. 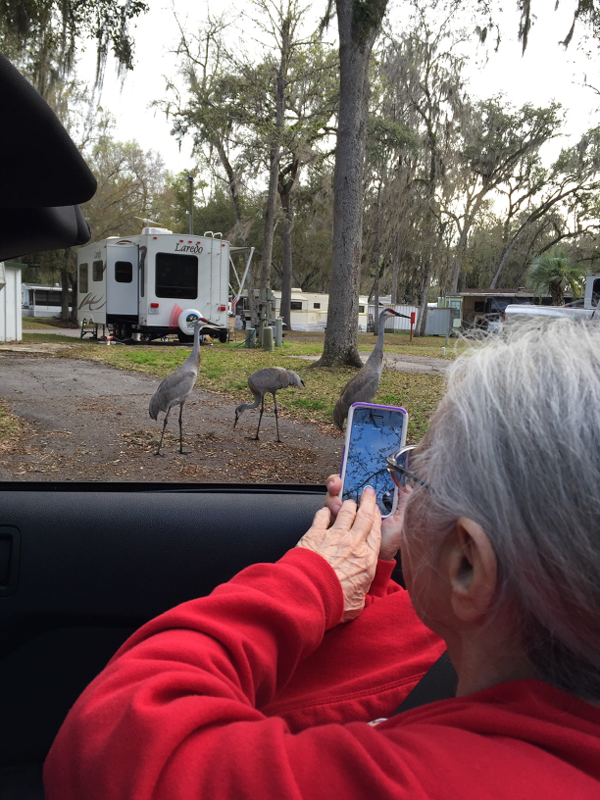 After a few years of enduring life in an RV and a 1000 mile commute every six months, they moved to Florida permanently. My visits to Florida were more great memories. When I was about 12, some combination of events caused me to have the opportunity to fly down to visit my grandparents, alone. In hindsight, this was quite a big deal. In spite of the logistical and safety concerns, the fact that I actually wanted to go down speaks volumes to how much I enjoyed spending time with my grandparents. My first time traveling solo was when I visited them. We went to the Kennedy Space Center. My grandfather took me fishing. My grandmother took me to the pool. I downloaded the demo of Homeworld onto their Compaq Pentium 3 and played it late into the night. It was a wonderful trip. Over the next 15+ years, I would travel to that same destination from various points across the US as I went to college, various Army posts, and New England. I made some visits alone, others were with family, and one was with a girlfriend-turned-fiance just a few hours before introducing her to another one of the other most special women in my life. My last solo trip to see her was in 2015. I upgraded my rental to a convertible to enjoy the mild February weather. We spent lots of quality time together. About two years ago I brought my son to see her, along with my father. 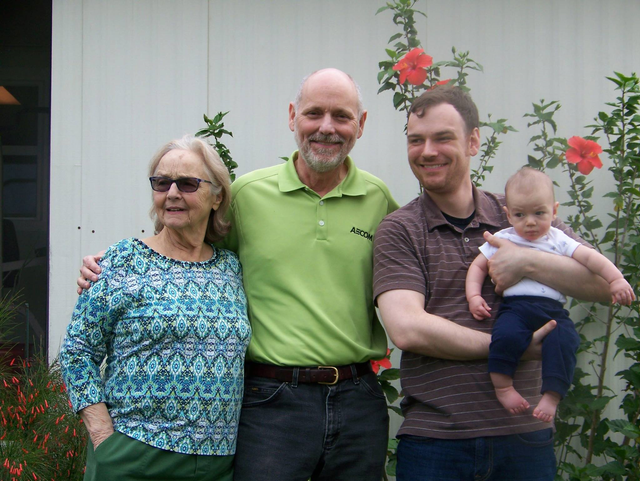 Four generations in one place – what a blessing! It was about that time that my grandmother’s health began to really decline. Over the next two years, her attention span decreased and her ability to interact like she used to also took a hit. She was still sharp mentally, but she was tired and worn out. She doted on my son when we visited or Skyped, but my relationship with her stagnated. No more solo visits. No more weekly phone calls between just the two of us. When her health really started to fail and she was placed in home hospice care, my father and brother went down to see her. I had told myself that I was good as far as seeing her “one last time” went. I was happy with the amount of time I was able to spend with her over the years, and I didn’t feel like I needed to show up one final time in order to let her know I cared. So with that in mind, I decided to stay home. During my family’s visit, I got to Skype with her a bit. It was clear that she was not long for this world. It was also clear to me that she was not in a position to have any kind of meaningful conversation over the telephone. She could barely keep her eyes open for any length of time, much less speak in the complete sentences required for a conversation. If I wanted a proper goodbye, it would have to be in person. I mentally debated making the last minute trip down to have this face-to-face. What would that accomplish? What would she get out of it? Not much, I thought. So what’s the point? I spent the day agonizing over the decision on whether or not to buy tickets to fly out the next day. My wife encouraged me to go. My dad said not to come: his mom was content and ready and my visit would not appreciably change things for her. My brother was the one who told me exactly what I needed to hear, in one of the best pieces of advice I’ve ever gotten in my life. When I finally let myself look inwards at my own heart, I realized that it was me who needed to see her, not the other way around. I bought the tickets and set my alarm for 4:00 AM. I wanted her to know just how much of a difference she made in my life. I had some dark times when I was younger, and her love and the knowledge of how proud she was of me was a big part of what got me through feelings of worthlessness and self-loathing. Knowing she was always there for me and always wanted to see me or talk to me was a huge encouragement to me during some of the loneliest periods in my life. I wanted her to know how much I was going to miss her. I wanted her to know that I would tell my children about her and what an amazing person she was, and what she did for me. I wanted her to know that her legacy would live on. I wanted her to know that I have always had tremendous love for her, and that I always felt like we had a special relationship. I wanted to say those words: special relationship. That was particularly important to me for some reason. I guess because I felt like I had something greater with her than most people have with a grandparent. And I wanted her to know that this is how I felt. I wanted to say “I love you” one last time and hug her and kiss her forehead and hold her hand. I brought with me two items. One was the airline ticket from the flight I took when I was 12. I have held onto it all these years and I thought it would be fun to show her. The other was a buckeye. One of three that her husband, my grandfather, had given me before he passed away a dozen years earlier. He told me they bring luck. They’re one of the few mementos I have of him. When I arrived, I spent some time just visiting and sitting with her. She was coughing up stuff every 30 minutes or so, and I would bring a tissue to her lips so she could spit it out. I was also able to give her some water. She was too weak to do these things for herself. Finally when I was alone with her, I took the opportunity to tell her all the things I needed to say. The tears started to flow and I choked up as I told her just how much she meant to me and how big of a difference she made in my life. I looked into her eyes and held her hand as I assured her that I would always remember her, and I would make sure my kids knew about her. We both smiled and exchanged a nonverbal message of mutual love and adoration. 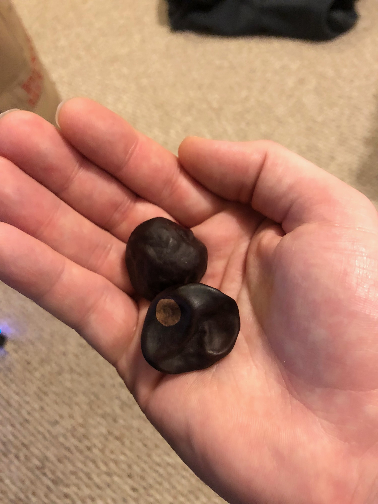 I pulled the buckeye out of my backpack. She was surprised to learn the origin story. I told her that I had three – one for each of my two children, and this third one that I wanted her to hold onto for a little bit. I think that knowing it came from her late husband was a small comfort to her. She held it in her hand for the rest of the afternoon. She let me know that she’s had a wonderful life. She said she has a wonderful family. She kept talking about being there at the beginning and the end. Maybe that was a reference to my own life and how she was there at my beginning and now I was there at her end? Maybe a reference to how my wife and I got together? Maybe it was a reference to the birth of my father, me, and then my son? I’m not sure, but she said it with contentment and satisfaction. Immediately after I wrapped up my verbal to-do list, a sense of peace washed over me. The tears stopped. I was able to enjoy the rest of my time with her. I held her hand. We played Carcassone (sort of) with my aunt. We watched some videos of her great-grandkids on my phone that my wife was sweet enough to supply throughout the day. I kissed her goodnight on the forehead. But I had already done what I came to do. I got what I needed, and it was clear that she lived her life in a manner where she had already been ready. I left her house 24 hours after I arrived, and two weeks later she was gone. 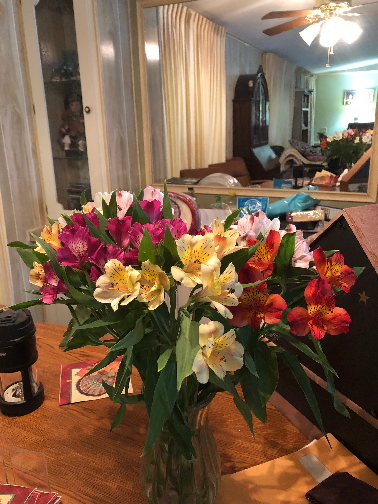 The day before she passed away, I ordered flowers to be delivered to her house. It was a bouquet of lilies. When they arrived, my aunt, who had been staying there taking care of her for the past few months, received them and called me. That’s when I learned that my grandmother had died a few hours prior. My aunt said she would have loved them. The note that came with the flowers will be placed inside the casket, next to the urn with my grandfather’s ashes. I think it’s a fitting final farewell. We love you and we hope you enjoy the flowers! You are so special to us, and we think about you every day. With lots of love, from your grandson, granddaughter-in-law, great-grandson, and great-granddaughter. Thankyou. Thankyou for sharing that story, for opening up an letting us see a little piece of who you are and what's important to you. Thankyou for the reminder to cherish the time we have with our loved ones, particularly as they get older. Finally thankyou for sharing the advice your brother gave you - that is something that will no doubt ring true for many of us in years to come. Thank you for the encouraging comment and kind feedback! I figure if this helps just one person make the decision to take that final trip for a last visit, I’ll be happy to have shared. My grandmother has just turned 92. She's still in excellent health, but I'm under no illusion that I'll need to make that similar decision in the coming years. In the meantime, I'm seeing her as often as I can and taking my daughter with me. ...back. What a great tribute! I have an entire back piece dedicated to my mother but reading this article suggests I should do more. This is the first time I’ve had an article tear at my emotions dude and I’ve been here over a year, congratulations. Thanks a lot for sharing and thanks a lot for a great read. God bless you and the entire dollars family. Happy hump day. Thank you sir! That comment really brightened my day! Really happy to hear it resonated with you. Thanks for the resteem! My cousin, the one I mentioned here, had a little bit of that “parent” flavor to her relationship with our grandmother. This is hitting her hardest for sure. Thank you again for the kind words, I really do appreciate them. Of course on the Resteem, my pleasure, I’m glad I could help. This one deserves to reach more people. All my condolences man. I'm sure your grandmother would love this tribute. That's a beautiful tribute. What a lovely lady. I'd like to express my condolences too. I'm an oldest grandchild also and even though the distance you had to your grandmother (probably) exceeds the distances I have to my grandmas I never had a similar relationship to either and neither the money to pay them visits on my own. 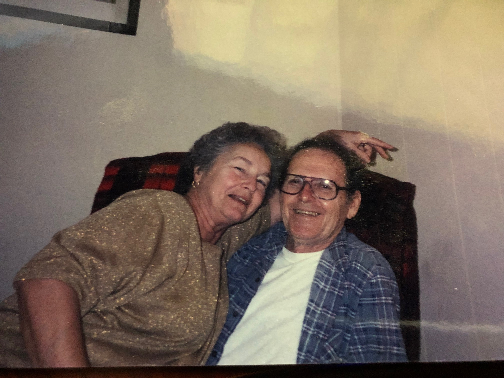 Both are on their late eighties too and the older one has increasing dementia for about 4 years, being completely bedridden and locked-in with herself now for a year. In fact I don't know about her current state actually as even my father's visits to her are getting rare. Thank you very much. Yeah, every relationship is different, even between the 5 grandkids my grandmother had and her. I was fortunate to have the ability to go see her so many times, and I don’t take that for granted. Dementia/Alzheimer’s is such a cruel disease.... my mom’s mother passed away after struggles with that. I have great sympathy for families going through that. I wish you and your family well. What a heart felt tribute and I send my thoughts to you and your family. She sounds like a wonderful woman and shared her love with everyone. Thank you for the kind words. She definitely did! my eyes teary as i read this. my condolences. you wrote beautifully about her, made me feel as if she was mine too, i hope you dont mind. a truly lovely soul she was and my gosh, one beautiful lady for sure. may she rests in peace. Howdy sir dollarsandsense..this is such a wonderful tribute to a wonderful lady, you were both lucky to have each other! Thank you @janton! I appreciate that. She will be missed but I’m a better person for having had her in my life. Absolutely sir dollarsandsense, that's the way it's supposed to be isn't it and I hope our grandkids will say the same things about us. A Wonderful Tribute ... and very well written. Thank you sir, I appreciate the kind words. In our last Algorithmic Curation Round, consisting of 325 contributions, your post is ranked at #217. It is good you managed to say what you wanted to say.